You are so right giveaways do bring a lot of traffic but a lot of it is one time visitors only. Hopefully though if you have good content those visitors may come back for more.Offering things like clipart unless its your own there may be copyright issues so have to be careful. I always have my clipart etc designed and I stipulate that must be used for commercial use. Really a great point there. Thank you for reminding us of such important use as copyright. BUT in order to get the training, you have to opt-in. I’m building my list, engagement, offering great content AND building traffic all at the same time! Thank you for a great contribution 🙂 I agree is all about engagement. 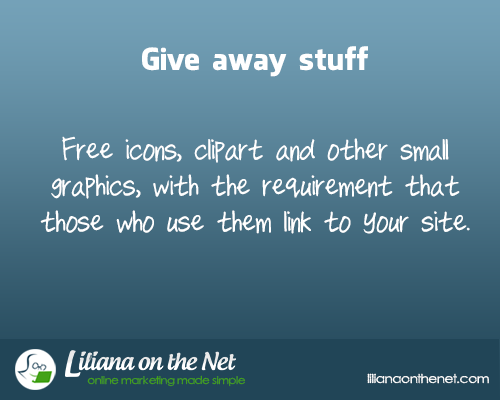 I think your suggestion of giving away clip art, icons or a package of small graphics is a great idea, considering nowadays everyone has to be careful about what images they use on their blog or website incase they breach any copyrights related issues.